As the month of May continues another Mega Man game hits the 3DS Virtual Console. Today saw the release of Mega Man IV, the final Game Boy game that saw past Robot Masters return from the robot scrapyard. Next week will see Mega Man V and the introduction of the Stardroids. However, Mega Man isn't the only thing going on the 3DS this week. We also have the release of Moon Chronicles, Renegade Kid's award-winning FPS only now in 3D. On top of that Atlus is having a sale on some of their games for two weeks from 9am PT on May 19th through 9am PT on June 2nd. In that time span you can get Code of Princess, Shin Megami Tensei: Devil Survivor Overclocked, and more for only $14.99 each. Over on the Wii U we have the digital release of Wii Party U as well as Scram Kitty and his Buddy on Rails, an on-rails game that has you leaping over obstacles and blasting hordes of enemies while on a space station. Sounds...interesting. We also have the NES class Adventures of Lolo on the Wii U's Virtual Console. If you're into puzzle games, I highly recommend checking this one out as it's been one of my favorite NES games since I was a kid. Wii Party U ?? Invite your friends over?? it? ?s time to party! Your living room becomes a party playground as you enjoy time together in comically themed board games and minigames that get everyone off the couch. Every kind of party can be found in this one unique package that takes advantage of your TV, Wii Remote controllers and the Wii U GamePad controller. Also available at retail, Wii Party U will now be available in the Nintendo eShop starting May 16. Scram Kitty and his Buddy on Rails ?? 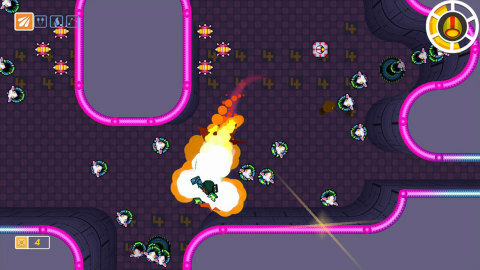 Featuring a unique control system that allows for 360-degree platforming action and thrilling 2D shooting, Scram Kitty and his Buddy on Rails sees players glide along colorful glowing rails, leaping over the space station? ?s ample hazards and blasting back endless hordes of enemy rodents. The titular Scram Kitty offers helpful tips and feedback in real time via the TV screen as the player battles on the Wii U GamePad controller. Scram Kitty and his Buddy on Rails is available exclusively in the Nintendo eShop on Wii U. Click here to check out the trailer. Moon Chronicles?? ?? Experience Renegade Kid? ?s award-winning first-person shooter, remastered in glorious 3D. Moon Chronicles delivers an atmospheric sci-fi adventure with enhanced graphics and intuitive touch-screen controls for a truly unique experience ?? all running at a silky-smooth 60 frames per second. Moon Chronicles is available exclusively in the Nintendo eShop on Nintendo 3DS. Click here to check out the trailer. Mega Man?? IV ?? It? ?s Mega May! Every Thursday in May, a different Mega Man game will launch in the Virtual Console section of the Nintendo eShop on Nintendo 3DS. This week? ?s release is Mega Man IV, which originally launched on the Game Boy system in 1993. Join Mega Man and his friends on another mission to put a stop to Dr. Wily. This time, the mad scientist has used a mind-control machine to reprogram robots from the World Robot Exposition to do his bidding. Blast your way to victory with classic Mega Man game play. Click here to check out the trailer. Adventures of Lolo ?? After the love of his life, Lala, is kidnapped by the devilish King Egger and taken to his haunted castle, our hero, Lolo, sets out to rescue her. The journey is perilous, as the Great Devil? ?s fortress is guarded by a massive army. But Lolo has a few tricks up his sleeve. He can move blocks to trap enemies, clear a path or use as a shield. He can also activate the Magic Shot that will turn enemies into eggs. But watch out, as a single touch from these creatures could spell trouble for our hero. Combining clever environmental puzzles with tricky enemies and an engaging style, Adventures of Lolo is a true NES classic. Big John Games Sale ?? For a limited time, Big John Games is discounting select games in the Nintendo eShop on Nintendo 3DS, including Smash Bowling 3D and Big Bass Arcade No Limit. This offer ends at 9 a.m. PT on June 5. ATLUS Sale ?? For two weeks, Code of Princess? ?, Shin Megami Tensei®: Devil Survivor?? Overclocked and morewill be at their lowest prices yet! Starting at 9 a.m. PT on May 19 through 9 a.m. PT on June 2, get these cool ATLUS games for $14.99 each in the Nintendo eShop on Nintendo 3DS.